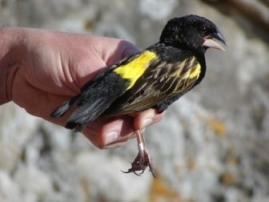 The aim of this project is to find as many weaver colonies as possible on the Cape Peninsula. It is part of a larger project to study weaver colonies, called PHOWN (Photos of Weaver Nests). You can help by adding weaver colonies that you find, or provide repeats for colonies already in PHOWN. Records will contribute to how colony sizes vary, and provide information on breeding distributions and densities of weaver colonies. 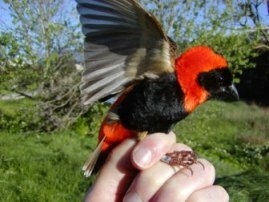 The four male weaver species on the peninsula can easily be distinguished if you have good, close up views: Cape Weaver, Southern Masked Weaver, Southern Red Bishop, and Yellow Bishop. (The females and yound birds are dull coloured). To take part in this project, you need a camera and internet connection, and you need to first register as a participant (minimum of your email is needed; to prevent spam from being uploaded) - see more here). 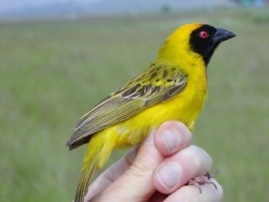 To upload a weaver colony, take a photo (1-3 photos) of the colony, record the date and place - read more here). To see a map of existing colonies for any of the species, see below - choose a species and hit 'Go' and a map will appear. You can zoom in (or out). You can click on a marker on the map and a page will open with the photos and details of that colony. You can come back to this page to see the map of colonies on the Peninsula again. 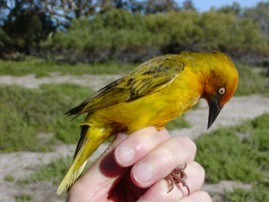 (To see details for any weaver species in the world, go here). Zoom in or out to see regions of interest; you can switch on the satellite view.